Where else to start but Paul Pogba? He’s made a decent start with two goals in his first two league games, but continues to get the brunt of criticism from pundits when things go wrong, as they did against Brighton. The France international just doesn’t look quite right in this United side, and he’ll need to influence big games like this one if he is to truly win the Paul Scholeses and Graeme Sounesses of this world. Though will Scholes dare anger Pogba’s agent Mino Raiola again after this thinly-veiled threat? As for Spurs, it will be interesting to see how Toby Alderweireld performs after continued links with United throughout the summer transfer window. If he has a solid display to shut out Alexis Sanchez, Romelu Lukaku and co. it will serve as just more fuel to Jose Mourinho’s transfer angst fire – then again, if he sticks around long enough, maybe it means he’ll get the signings he wants in future? United lost and lost badly to Brighton. It may only have been 3-2 in the end, but they were distinctly second best throughout. Considering they were up against a team put together at a fraction of the cost of this Red Devils squad, that’s a damning result. As for Tottenham, they made it two wins out of two for the season with a 3-1 victory over newly-promoted Fulham, with Harry Kane even realising he can score in August, a duck broken at a bad time if you’re a United fan. Was the FA Cup semi-final. Tottenham took an early lead through Dele Alli and then did what Tottenham do best in those games…they bottled it. Alexis Sanchez equalised with a superb header before Ander Herrera struck home the winner in the second half, making it two FA Cup semi-final defeats in a row for Mauricio Pochettino, who’s still without a trophy for Spurs. 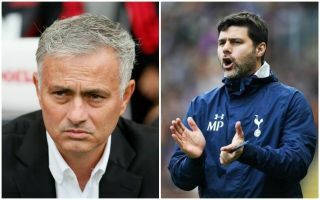 Well, Pochettino might not have a trophy yet as he heads into his fifth season in charge of Tottenham, but we’re not sure Spurs fans would swap him for Mourinho right now. The Portuguese will tell you he won three trophies in his first year at Old Trafford, but it’s a sign of how far the mighty have fallen that he’s bragging about the Community Shield, the League Cup, and the Europa League – one of those awarded for winning just one game, the other a trophy he once notably mocked Rafael Benitez for winning. Jose Mourinho’s tricky start to continue? Still, head to head it’s pretty even between these two, with three wins for Mou and two for Poch since the former took the United job in 2016. If the Argentine can make that a third this weekend, one imagines that’ll be big pressure on the man in the opposite dugout as talk hots up about Zinedine Zidane being primed to replace him (as per the Mail). Spurs do have the habit of messing these games up, so relying on them after a bizarre lack of summer signings against a wounded United side at Old Trafford is undoubtedly risky. However, this start by Mourinho’s side just looks too similar to that 2015/16 meltdown at Chelsea, so we can’t see them having the confidence or craft to find their way past such an organised defensive side who also have a frightening attack when the likes of Harry Kane, Dele Alli and Christian Eriksen all click. Sticking our necks out for a close 2-1 away win. What's your prediction for Man Utd-Spurs?